Becoming a member of the Laser One family is a fun and rewarding experience. Our staff is full of enthusiastic, dedicated, hard-working, and outgoing individuals who are looking to meet new people and who enjoy working in a fun, action-packed environment. Our most enthusiastic individuals are offered the opportunity to become party heroes. These are the well-trained leaders who run our famous birthday parties here at Laser One. But employment at Laser One is not all work all the time! Each month, our managers and employees get together on "Employee Night" for dinner, laser tag and miniature bowling as well as free arcade games and other fun activities. We have even been known to hold various competitions for official Laser One bragging rights on games like The Fast and the Furious, NBA Hoops, and air hockey, as well as employees vs. managers all-out laser tag matches. We offer our staff very flexible scheduling, and the schedule can be viewed on our website in the secure employee section at any time. Many of our veteran staffers who have gone away to college return during the summer and other college breaks to visit with old friends, play laser tag, and even help us out! We constantly seek the best of the best to join our Laser One staff. Are you a fun, outgoing individual who likes to meet new people? Are you hard-working and dedicated? 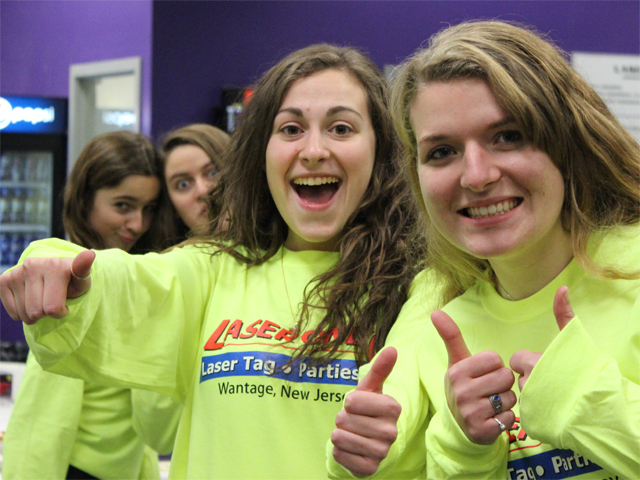 Do you like kids and enjoy playing laser tag? Would you like to make a bit of extra money? We want you to join our staff!